The second official Service Saturday of the school year was a busy one, with many students spending several hours actively engaged in giving back to our local community on February 2nd. Two of the service sites were in nearby Cobourg, including the Pet Valu location where a group of students spent the day washing dogs as part of a fundraiser for Northumberland Humane Society. Elbow-deep in pet shampoo, the students enjoyed the chance to work with the animals and to support the efforts of our local shelter, which is a long-time community partner in our service learning program. Also in Cobourg, a group spent the afternoon at Beyond the Blue Box, helping to organize stock and clean up around the store. The mission of the store is to reduce waste by taking in used items for sale; it also provides job opportunities for adults with developmental exceptionalities. Our students had a great afternoon working with the BBB staff. 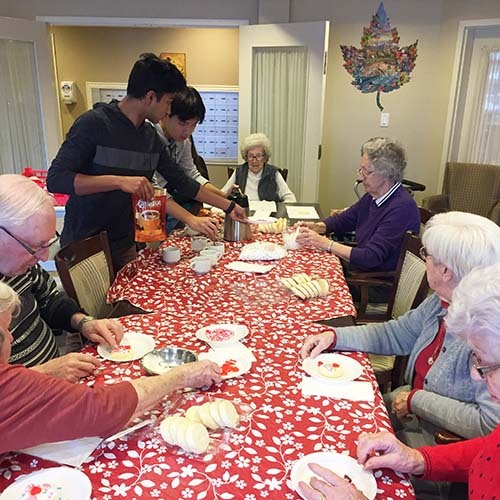 Down the road from TCS, students walked to the Extendicare long-term care facility. There, they spent time with residents, playing a game of Scrabble before settling down to decorate some Valentine's Day themed cookies. Thank you to our community partners for welcoming our students and providing them with opportunities to serve, to connect and to grow. And special thanks to our chaperones: Ms. Vojnov, Mr. Peter Mao, Mr. Rafay Ahmed and Mr. Ryan Byrne.